This recipe was clipped from a magazine and was published in 1958. I’ve typed it below along with a scanned copy. 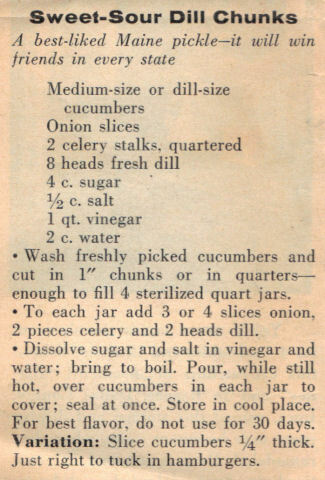 Wash freshly picked cucumbers and cut in 1″ chunks or in quarters–enough to fill 4 sterilized quart jars. To each jar add 3 or 4 slices onion, 2 pieces celery and 2 heads dill. Dissolve sugar and salt in vinegar and water; bring to boil. Pour, while still hot, over cucumbers in each jar to cover; seal at once. Store in cool place. For best flavor, do not use for 30 days. Variation: Slice cucumbers 1/4″ thick. Just right to tuck in hamburgers.